Department of Biotechnology K L University Vaddeswaram Guntur, Andhra Pradesh INDIA. Dept of Biotechnology National Institute of Technology Warangal, Telangana, INDIA. The present study was intended to isolate actinomycetes VSM-6 from deep sea sediment samples of Bay of Bengal that is potent to produce L - asparaginase. The identification of the isolate was executed by polyphasic taxonomy. Optimization was carried out one factor at a time (O-F-A-T) for the production of the L - asparaginase. RSM was pledged to optimize the L - asparaginase production by S.labedae VSM-6. Central composite design was applied to study the influence of the variables and their interactive effects on the production of L - asparaginase. Unstructured Kinetic modelling for L - asparaginase production was adopted using Leudeking-Piret (LILP) and Logistic Incorporated Modified Leudeking-Piret (LIMLP) models. Optimization using One-Factor-At-A-time registered a turnout of 8.92 IU/ml of L - asparaginase production. But results obtained from the statistical design are in agreement with the experimental results. The model followed the second order polynomial equation and the model adequacy was determined by the P value (<0.0001), Coefficient determination (R2) with a value of 0.9942 and the adjusted R2 = 0.9087 which determines that the model was significant. The experimental values are in compliance with the model anticipated values and catalogued an escalation in yield of L - asparaginase (10.17 IU/ml) by RSM. Unstructured Kinetic modelling for L - asparaginase production adopting Leudeking-Piret (LILP) and Logistic Incorporated Modified Leudeking-Piret (LIMLP) models showed L - asparaginase production of (10.17 IU/ml), closer to model anticipated value (10.23 IU/ml) so unstructured models provided a better approximation for L - asparaginase production by S.labedae VSM-6. From our study we have reported for the first time the production of L - asparaginase from S.labedae VSM-6 using central composite design and kinetic modelling. L-asparaginase is also used in food industry to counter the formation of acrylamide in food processing at extreme temperatures, retaining their nutritional properties. This is vital because acrylamide acts as a neurotoxin classified as potentially carcinogenic to humans.5 The micro-organisms are contemplated as cardinal source of L-asparaginase synthesis. The best producers of L-asparaginase in pharmaceutical industry are E.coli and Erwinia carotova used for the medication of lymphoma and Leukaemia.6 However, prolonged administration of L-asparaginase, causes hypersensitivity, immune inactivation, allergy, nausea, pancreatitis, diabetes and coagulation abnormalities.7 In addition, most of asparaginases have low stability and catalytic activity and are active in a narrow pH range.8 Thus intensive research is essential for exploring new L-asparaginases, produced by different category of micro-organisms other than bacterial sources forthwith used has potential to obtain new enzymes with desirable properties. Several researchers have studied the isolation of actinomycetes that produce this important enzyme such as Streptomyces karnatakensis, S. venezuelae,9 S. phaeochromogenes FS-39,10 S. albidoflavus,11 S. gulbargensis,12 S. tendae TK-VL_333,13 Nocardia levis14 etc. Composition of the fermentation medium and the culture conditions play a profound role on the production of enzyme and the production is influenced by a number of interactive effects of the nutritional and environmental factors.15 The long-established methods engage, optimization of one-factor-at-a-time (OFAT) (Nutritional and Cultural factors) method which is inadequate to estimate the interactive effects possible between the factors that are significant for the maximization of the enzyme production.16 Hence statistically engineered optimization of the fermentation process is far more beneficial and admirable to classical methods due to the fact that it scrutinize the interactive influence of the process variables in which a single variable is varied at any time.17,18 Statistically designed minimum number of the replicates executes the information of the effects of main factors and the viable interactions amid them.19 Statistical optimization to amplify the enzyme production is persuaded by a number of process variables that are assorted in to two i) media constituents such as carbon, nitrogen minerals and salts ii) cultural parameters such as pH, temperature and incubation time. Hence the method of desirability which is a multi-response optimization path is engaged in this context.16 Based on the dimension of multiple responses a set of conditions are determined by the desirability function that designs a set of competently stabilized optima for all the responses involved. Hence the current study desired at optimizing and evaluating the interactive effects of the process variables for the production of L-asparaginase by Streptomyces labedae VSM-6 employing response surface methodology. Bioengineers use mathematical equations for modelling aspects, which are contemplated as robust tools, to figure out complex nature of microbial fermentations. These models become very fundamental for successful design of bioreactor and take care of biomass growth, carbon substrate employment and product accumulation kinetics. The activity of L-asparaginase produced by marine actinomycetes has not been fully explored. Extracellular asparagine’s are more superior to intracellular ones as they can be produced in affluence in culture broth under normal conditions and can be purified economically.20 In this study, an attempt has been undertaken to unveil the production and optimization of extracellular L-asparaginase from marine actinomycete Streptomyces labedae VSM-6 from Bay of Bengal of Visakhapatnam region, coastal Andhra Pradesh, India. The deep sea marine sediment samples were collected at different depths of the Bay of Bengal of coastal Andhra Pradesh, India with the help of National Institute of Ocean Technology (NIOT), Visakhapatnam and mixed to generate a composite sample for further analysis. Sediment samples were collected using clean, sterile, Ziploc bags and transported to the laboratory. The collected sediment samples were dried in a laminar flow hood for a certain period of time and sieved to eliminate large particles. Samples were preserved at 4°C until pre-treatment which was required for eliminating unwanted microbes. The dried sediment sample was pre-treated with peptone (6%) and sodium lauryl sulphate (0.05%) at 50°C for 10 min.21 The pre-treated sediment samples were then dissolved in 0.9 % saline water and serially diluted down to 10-5 dilution. 100 μl aliquots of 10−5 dilution was plated on starch casein agar medium (soluble starch-10 g, casein-1g, KH2PO4-2g, KNO3-2g, NaCl-2g, MgSO4 7H2O- 0.5g, CaCO3- 0.02g, FeSO47H2O- 0.001 g and agar -20 g/ 1 (pH 8) supplemented with nalidixic acid (50 μgml−1) and cycloheximide (50 μgml−1) to inhibit the growth of gram negative bacteria and fungus. The plates were incubated at 30°C for 3 weeks to one month. After incubation dry, powdery, filamentous colonies were identified as actinobacterium were further selected and maintained by sub culturing on yeast extract malt extract dextrose agar (ISP-2) slants. The genomic DNA used for the PCR was prepared from the single colonies grown on the Yeast extract malt extract dextrose agar (ISP-2) medium for 3 days. The whole genomic DNA extracted from the strain (VSM-6) was isolated employing the DNA purification Kit (Pure Fast® Bacterial Genomic DNA purification kit, Helini Bio molecules, India) consistent with the manufacturer protocol. The 16S rRNA gene fragment was amplified using universal Primers. (Forward Primer -5’-GCCTAACACATGC-AAGTCGA-3’ and Reverse primer - 5’-CGTATTACCGCGGCTGCTGG-5’).28 The amplified fragment was analysed using 1% agarose gel and the fragment was purified (Helini Pure Fast PCR clean up kit, Helini Bio molecules, India) according to the manufacturer instructions. The bands were analysed under UV light and documented using Gel Doc. The direct sequencing of PCR products was performed by dideoxy chain termination approach using 3100-Avant Genetic Analyzer (Applied Bio systems, USA). The obtained sequences were analysed for homology using BLASTN (Entrez Nucleotide database). The 16S rRNA gene (r DNA) sequence of the strain VSM-6 was registered in the Gen Bank database with the accession number. Preliminary screening for L-asparaginase activity was evaluated by using modified M-9 medium29 incorporated with phenol red (0.009%) acts as pH indicator dye and adjusted the medium pH to 7 and incubated at 30°C for 5 days. Quantitative estimation of enzyme activities was carried out using M-9 liquid medium. L-asparaginase assay was carried out according to the procedure described by Imada et al.30 The reaction was started by adding 0.5 ml of culture filtrate and 0.5 ml 0.04 M L-asparagine as substrate and 0.5 ml of 0.05 M tris amino methane (Tris-HCl) buffer at pH 7.2 and incubated at 30°C for 20 min in a water bath shaker. The reaction was stopped by adding 1.5 M trichloroacetic acid. The precipitated protein was removed by centrifugation and the ammonia liberated was determined spectrophotometrically at 450 nm after the addition of 0.2 ml of Nessler’s reagent. The enzyme activity was expressed in IU. One International Unit of L-asparaginase activity is defined as the amount of enzyme required to release 1 μmol of ammonia per ml/min. Three different standard media such as Asparagine dextrose salts broth (M1) (L-asparagine (0.5%), Dextrose (1%), K2HPO4 (0.1%), Trace salts solution (0.1%), pH – 7.2); Modified ISP-2 broth (M2) (Yeast extract (0.4%), Malt extract (0.4%), Glucose (1%), L-asparagine (0.5%), pH -7.2); Glycerol asparagine broth (M3) (Glycerol (1%), L-asparagine (0.5%), K2HPO4 (0.1%), MnCl2 (0.01%), FeSO4 (0.01%), ZnSO4 (0.01%) pH - 7 were used in comparative studies to find suitable fermentation medium for L-asparaginase production. The media were inoculated with culture suspension prepared from one week old culture of strain. The inoculated flasks were incubated at room temperature for 8 days in order to estimate the cell growth of the strain and L-asparaginase production for every 24 h interval. The medium in which the strain exhibits maximum L- asparaginase activity was fixed for further studies. Influence of different environmental parameters such as initial pH and incubation temperature on the production of L-asparaginase was determined. The effect of pH on the production of L-asparaginase was examined by culturing the strain in modified starch casein broth with pH ranging from 6-9. The pH at which maximum activity occurs is considered the optimum pH, used for further study. The effect of temperature on L-asparaginase production was resolved by culturing the strain in production medium at different temperatures varying from 20 to 40°C for 144 h of incubation. The temperature at which maximum yield of enzyme observed is considered the optimum temperature. In order to examine the impact of the different carbon and nitrogen sources on the L- asparaginase production by the strain, the production medium was supplemented with different simple and complex carbon sources such as glucose, maltose, galactose, starch, fructose, lactose, glycerol, mannitol, sucrose, arabinose and xylose each at a concentration of 1%. The influence of different concentrations (0.5 - 3%) of best carbon source on enzyme production was also investigated. Similarly, the influence of nitrogen sources on enzyme yield was investigated by supplementing different nitrogen sources like peptone, yeast extract, meat extract, bio peptone, soya peptone, beef extract, malt extract, tryptone, ammonium chloride and ammonium sulphate each at a concentration of 0.5% to the production medium containing an optimum amount of the superior carbon source as investigated above. Further the actual concentration of nitrogen source (0.5-2.5%) supporting maximum yield of enzyme was also recorded. Besides, the optimal concentration of the substrate L-asparagine (0.5-2.5%) supporting high yields of L-asparaginase production under induced conditions to test for stimulation of enzyme production was determined by retaining all other conditions at optimum levels. Data obtained on the L-asparaginase production under different culture conditions were statistically analysed and expressed with one-way and two-way analysis of variance (ANOVA). To analyse the estimation ability of the method the predicted values of the responses obtained for RSM were compared with actual response values. The data obtained was analysed using Design-Expert software (Version 7) to yield the regression equation and to execute the combinatorial effect of the parameter combinations for the production of L-asparaginase. The significance of the model was analysed using the Fisher’s F-test as well as Student’s T-test at a probability P value of 0.05. Coefficient of determination (R2) determines the accuracy of the model and to evaluate the significant differences between the factors. The R2 value should be close to 1. In addition adjusted coefficient of determination (R2adj) and predicted coefficient of determination (R2pred) were evaluated to investigate the model adequacies. Insignificance of the lack of fit is another diagnostic test to check the model significance which compares the pure error, based on the measurement of the replicates. Analysis of the variance (ANOVA) was applied to analyze the statistical significance of the regression coefficients after selecting the most accurate model. The designed model was validated statistically with respect to L-asparaginase production under the conditions predicted by the model in an Erlenmeyer flask. Unstructured kinetic models consider the cell as a single entity and reaction rates depend on conditions present in the cell immediate environment. These models contain cell growth, substrate uptake and product formation kinetics. Actinomycetes model developed by Ushakiranmayi et al.34 was used to simulate the data obtained from marine actinomycetes Streptomyces labedae VSM-6 fermentation on M-3 media, with optimized conditions. A total of twenty morphologically distinct actinomycete isolates attained from deep sea sediment samples of Bay of Bengal were selected and evaluated for the production of L-asparaginase by plate screening assay using M-9 media. Five strains were found positive on the basis of the pink zone around the colony. L-asparaginase produced by the positive strains was quantified and potent strain VSM-6 was further selected for polyphasic identification. Ten selective media (Table 2) have been used to monitor the distinct colony morphology of the isolate. The strain exhibited luxuriant growth on ISP-2 (Yeast extract malt extract dextrose agar), ISP-3 (Oat meal agar), ISP-5 (Glycerol asparagine agar), starch casein agar, nutrient agar and Czapek-Dox agar medium. Moderate growth was observed in ISP-1 (Tryptone yeast extract agar), ISP-4 (Inorganic salts starch agar), ISP-6 (Peptone yeast extract iron agar) and ISP-7 (Tyrosine agar). The colour of the aerial mycelium varied from greyish white to white while the substrate mycelium assorted from pale yellow to brown. Different colour series of actinomycetes were documented in marine environments35 as well as in soil.36 No pigment was noticed on any of the tested medium including melanin pigmentation on ISP-7. The physiological and biochemical aspects of the isolate are given in Table 3. The strain is gram positive and it has shown positive results for catalase production, nitrate reduction, starch hydrolysis, gelatine liquefaction, Voges-Proskauer test, citrate utilization, casein hydrolysis but negative for H2S Production, methyl red test and indole production. It had the efficiency to produce different enzymes such as urease, amylase, asparaginase and protease. Growth of the strain occurred in the pH range of 6-10 with optimum growth at pH 7.5. The temperature range for growth was 20-45°C with the optimum growth at 30 °C. The strain exhibited salt tolerance up to 9% therefore the strain may be placed in the intermediate salt tolerance group. The salt concentration has an intense effect on the production of antibiotic from micro-organisms due to its effect on the osmotic pressure to the medium.37 The strain exploited a wide range of carbon sources such as fructose, galactose, glucose, maltose, lactose, sucrose, arabinose, rhamnose but not utilized xylose and raffinose. Carbohydrate utilization plays a prominent role in the taxonomic characterization of actinomycetes strains.38 The strain displayed sensitivity to a number of antibiotics such as ampicillin, tetracycline, vancomycin, amoxicillin, ciprofloxacin, chloramphenicol and erythromycin and defiant to streptomycin, gentamycin, methicillin and nalidixic acid (Table 4). 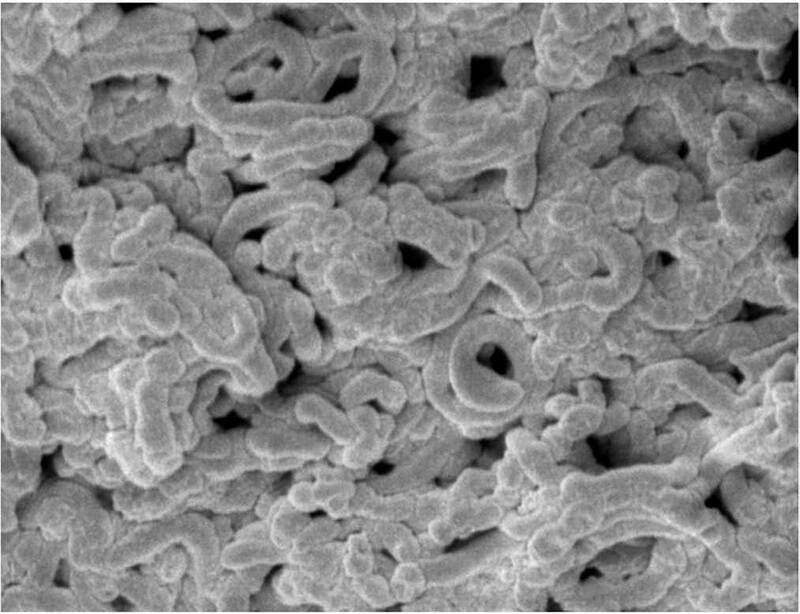 The spore chain ornamentation and spore morphology of the isolate was observed by scanning electron microscopy. Micro morphology and scanning electron microscopic studies revealed the spore chain morphology of S.labedae as spiral type (Figure 1) and hence it can be placed in the spira group of the family Streptomycetaceae and the genus Streptomyces.39 These results were firmly established by the identification of the culture by 16S rDNA sequencing. Gene sequence of 16S rRNA of VSM-6 was blasted against nucleotide database of the NCBI. The library search reported matching strains and the sequences had been aligned with the set of published sequence on the basis of the conserved primary sequence and additionally with the aid of nucleotide blast similarity search assessment. The 16S rDNA gene sequence of the isolate VSM-6 displayed a close relation with Streptomyces labedae (Figure 2). The rDNA sequence was deposited in the GenBank database of NCBI with an accession number KU507595. Molecular Phylogenetic analysis by Maximum Likelihood method The evolutionary history was inferred by using the Maximum Likelihood method. Based on the Tamura-Nei model. The tree with the highest log likelihood (-35681.53) is shown. Initial tree (s) for the heuristic search were obtained automatically by applying Neighbor-Join and BioNJ algorithms to a matrix of pair wise distances estimated using the Maximum Composite Likelihood (MCL) approach, and then selecting the topology with superior log likelihood value. 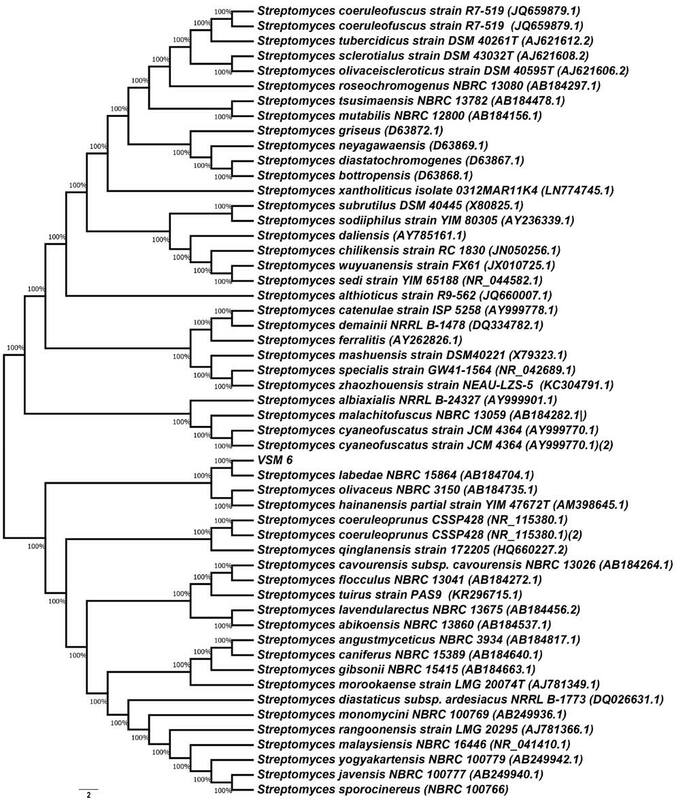 Influence of various physico-chemical parameters on the production of L-asparaginase production by Streptomyces labedae VSM-6. (a) Influence of culture media and incubation period, (b) Effect of pH, (c) Effect of temperature (d) Effect of carbon sources, (e) Effect of different concentrations of starch, (f) Effect of nitrogen sources, (g) Effect of different concentrations of yeast extract, (h) Effect of different concentrations of L-asparagine. (Data on cell growth and bioactive metabolite yield were statistically analyzed by Two-way ANOVA and found to be significant at 1%). Initial pH levels of the culture medium had a profound effect on the production of L-asparaginase by the strain. 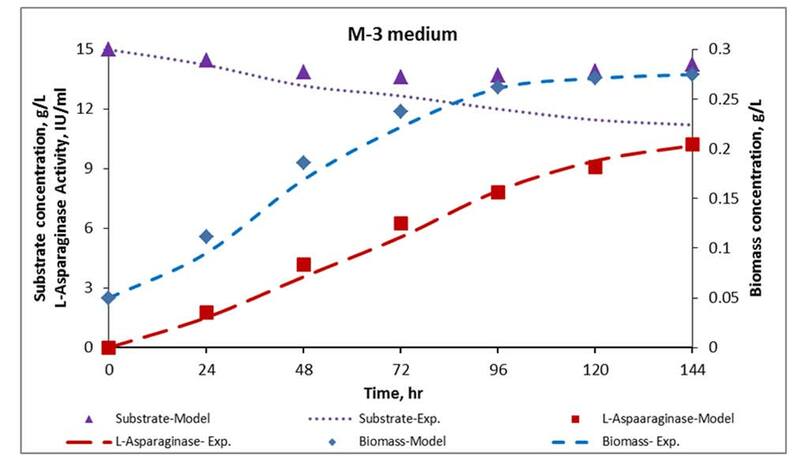 The maximum production of biomass as well as enzyme was detected at pH 8 after 144h of incubation (Figure 3b). These findings are consistent with the results of Saleem et al.42 for marine actinomycetes where pH 8 was optimum for L-asparaginase production. Narayana et al. 11 revealed the optimum pH for L-asparaginase production at pH 7.5 by S. albidoflavus. Influence of temperature on L-asparaginase production was recorded by cultivating the strain at different temperature ranges between 20 to 45°C. There was a steady escalation in the enzyme activity with increase in temperature from 20°C and reached maximum at 30°C (Figure 3c). Extreme temperature did not favour L-asparaginase production by the strain. These findings are in conformity with the results of Mostafa and Salma,43 Abdel-Fatah,10 Kavitha and Vijayalakshmi,13 Selvam and Vishnupriya.44 who recorded 30°C as optimum temperature for L-asparaginase production in S.collinus, S. longsporusflavus F-15, S.tendae TK-VL_333, S.acrimycini, respectively. The production of L-asparaginase was high in glycerol-asparaginase production medium with optimized initial pH 8 at 30°C for 144h incubation by S.labedae VSM-6. Besides, incorporation of L-asparagine in the production medium stimulated the synthesis of more L-asparaginase production by the strain. The study of different levels of L-asparagine (0.5-2.5%) revealed that the production of L- asparaginase and cell growth by the strain was high in medium containing 1% L-asparagine (Figure 3h). L-asparagine was reported to be a suitable nitrogen source for L- asparaginase production by Streptomyces venezuelae, S. karnatakensis,9 S. collinus,43 S. gulbargensis12 and P. endophytica.49 Abdel-All et al.50 reported glycerol L-asparaginase yeast extract medium (GAY) as most effective optimum fermentation medium for the synthesis of L-asparaginase by S. phaeochromogenes FS-39. In the present study, the optimal cultural conditions for the production of L-asparaginase by S.labedae VSM-6 were reported. The yield of L-asparaginase by the strain was high in M-3 production medium supplemented with 1.5% starch, 1% yeast extract and 1% L-asparagine with initial pH 8 at temperature 30 °C for 144 h of incubation. This is the first report on the production of L-asparaginase by S.labedae VSM-6. Conventional practice of optimizing O-F-A-T is time consuming and demands large number of experiments to determine the optimum points. Optimization applying O-F-A-T requires varying one independent variable while keeping all other factors constant optimized value. This process is extremely time consuming, expensive for large number of variables and this process cannot analyse the interactive effect of the variables and also lead to false conclusions.51 This limitation can be eliminated by employing optimization of all the contributing factors together using a statistical experimental design RSM.52 The tools of the experimental design execute the information rich data and use of RSM has made this method increasingly important. CCD was used to optimize the L-asparaginase production. The present study was under taken to optimize the nutritional and cultural conditions (Incubation time, pH, temperature, concentration of starch, yeast extract and concentration of L-asparagine) using RSM for maximizing the production of L-asparaginase by Streptomyces labedae VSM-6. To study the interactive effect of the six process independent variables on the production of L-asparaginase a CCD having 10 central points leading to a total of 86 experiments were executed. Equation 2 signify the mathematical model in relation to the L-asparaginase production by the interactive effects of the process variables and the second order polynomial coefficient for each term of the equation determined through the multiple regression analysis applying the Design Expert software. Supplementary Table 1 represents the experimental and the predicted values for the L-asparaginase production. Model predicted values are in good agreement with that of the experimental values. The optimized values of the process variables for the L-asparaginase production by Streptomyces labedae VSM-6 was found to be incubation time (6 days), pH (8), Temperature 30 °C, Concentration of Starch, Yeast extract and L-asparaginase was 1.5%, 1% and 1% respectively and in these conditions the L-asparaginase activity recorded was 10.17 IU/ml. Y = represents the L-Asparaginase (IU/ml) production as a function of the coded levels of Incubation time (A), pH (B), Temperature (C), Concentration of starch (E), Concentration of Yeast extract (F) and concentration of L-asparaginase (F). 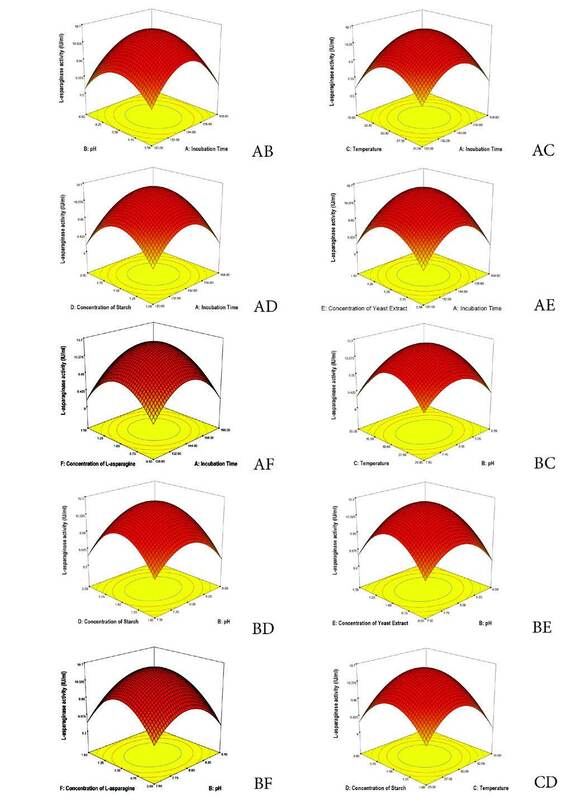 To analyze the interactive effects among the different process variables and also the optimum level of each independent factor for maximization of L-asparaginase production by Streptomyces labedae VSM-6, 3D response plots were designed on the basis of the model equation. In the 3D response plot two variables are kept constant while the other one is present in the investigation range (Figure 4). Level of each variable influencing the increase in the yield of L-asparaginase was analysed by plotting the response surface plots (L-asparaginase production) on the Z- axis against the two independent variables and keeping the third variable at constant (Figure 4). Maximum production of the L-asparaginase was recorded at the constant middle value of the process variable factors. Increase in the middle value showed a decrease in L-asparaginase production. The optimized values of the process variables for the L-asparaginase production by Streptomyces labedae VSM-6 was found to be incubation time (6 days), pH (8), temperature 30°C, Concentration of Starch, Yeast extract and L-asparaginase was 1.5%, 1% and 1% respectively and in these conditions the L-asparaginase activity recorded was 10. 17 IU/ml. Response surface plots showing interactive effects of selective variables on L-asparaginase production (AB) Incubation time and pH (AC) Incubation time and temperature (AD) Incubation time and Starch (AE) Incubation time and Yeast extract (AF) Incubation time and L-Asparagine (BC) pH and temperature (BD) pH and starch (BE) pH and Yeast extract (BF) pH and L-Asparagine (CD) Temperature and Starch (CE) Temperature and Yeast extract (CF) Temperature and L-Asparagine (DE) Starch and Yeast extract (DF) Starch and L-Asparagine (EF) Yeast extract and L-Asparagine. 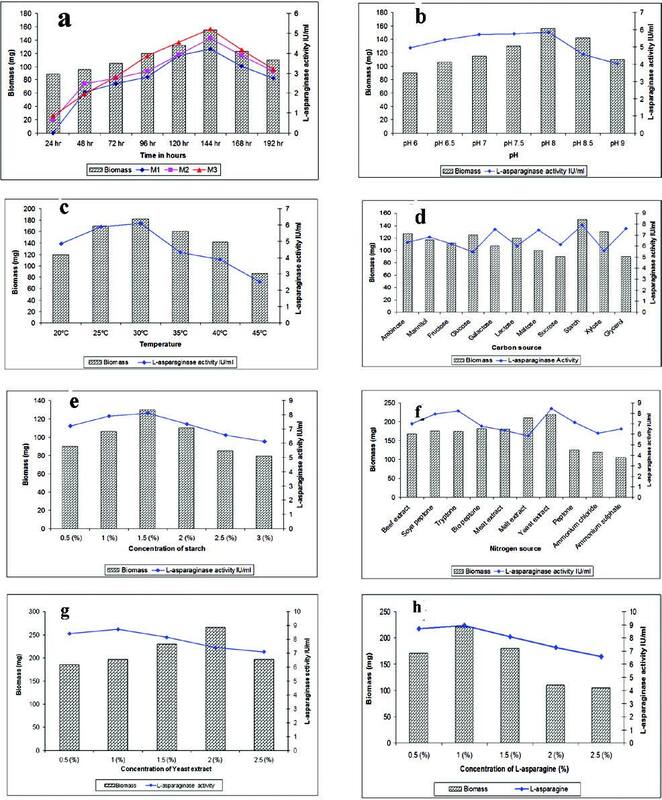 The profiles of S.labedae VSM-6 growth concentrations, substrate (1.5% starch) concentrations in M-3 media and L-Asparaginase activity of results obtained from shake flask fermentations and model kinetics were compared in Figure 5. Table 7 also shows kinetic parameters μmax, X0, Xmax, α, β, γ and η values. Kinetic parameters like μmax, X0 and Xmax were calculated from S.labedae VSM-6 growth kinetic profile using Logistic (L) model and it was observed that model predicted and experimental obtained values have shown very good fit. α and β, growth and non-growth associated product parameter values, were estimated using Logistic Incorporated Leudeking-Piret (LILP) model and a higher value of α than β confirmed that L-Asparaginase production by S.labedae VSM-6 is more growth associated than non-growth associated. The Logistic Incorporated Modified Leudeking-Piret (LIMLP) model simulated parameters, γ and η, are also show good regression square (R2), confirms that this model is more appropriate to represent 1.5% starch (in M-3) utilization kinetics in L-Asparaginase production by S.labedae VSM-6. L-Asparaginase activity from experiment value (10.17 IU/ml) is much closer to model predicted value (10.23 IU/ml) and hence, the used unstructured models provided a better approximation for L-Asparaginase production by S.labedae VSM-6. Experimental and model predicted kinetics of biomass growth, substrate utilization and L-Asparaginase activity using M-3 medium. A potent L-asparaginase producing actinomycete was isolated from deep sea sediment sample collected from Bay of Bengal. The isolate was identified as Streptomyces labedae based on the cultural, biochemical and molecular approaches. L-asparaginase production by S.labedae VSM-6 was initially optimized using one factor at a time (O-F-A-T) where the yield of the L-asparaginase was recorded to be 8.92 IU/ml. The optimal values obtained from O-F-A-T were selected and the experimental model was designed using response surface methodology. Central composite design (CCD) of RSM was employed for optimization of L-asparaginase production and yield of L-asparaginase was recorded to be 10.17 IU/ml. The model was found to be significant and the model followed the second order polynomial equation. The experimental values are in good agreement with the predicted values of the model. Unstructured Kinetic modelling for L-asparaginase production using Leudeking-Piret (LILP) and Logistic Incorporated Modified Leudeking-Piret (LIMLP) models revealed that L-asparaginase production was found to be (10.17 IU/ml) is much closer to model predicted value (10.23 IU/ml) and hence, the used unstructured models provided a better approximation for L-Asparaginase production by S.labedae VSM-6. The first author U.K.M is grateful to University grants commission (U.G.C) , New Delhi, Government of India, for providing financial assistance in the form of fellowship to carryout this work. Conflicts of interest CONFLICT OF INTEREST All the authors declare that there is no conflict of interest.